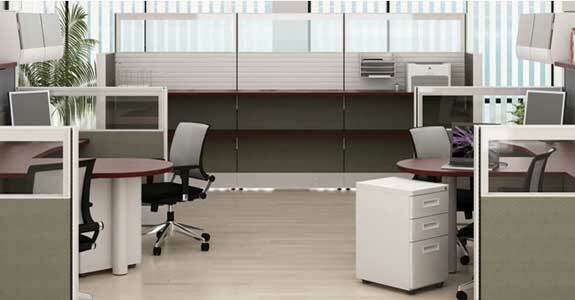 Office furniture rental represents yet another choice available to our Houston area businesses. Many organizations in and around the city are currently seeking to minimize their purchasing costs—particularly during short-term projects or while office renovation work is in process. While there are significant cost benefits to office furniture rental over office furniture purchases, we want to emphasize that these benefits are directly proportional to time. This is because the cost of office furniture rental is calculated by totaling the total price of every item and dividing it by the length of term. For a short period of time, this is obviously much less expensive than buying new or even refurbished office furniture. However, the longer your term lasts, the more, the cost of renting office furniture approaches, and then exceeds the cost of purchasing office furniture. Past that threshold, the cost of rental actually becomes higher. This is not to say that there is never a situation where office furniture rental is not the preferred choice. In transitional environments– such as an office in the middle of a remodel—it is far more practical and cost effective to lease office furniture until the remodel is complete. Another instance where office furniture rental works very well is in the construction industry. Construction job sites are temporary facilities that are erected to oversee the project. Purchasing office furniture is not practical for such projects—particularly when the buildings containing the furniture are temporary themselves. We have also seen many call centers and telemarketing companies do very well with office furniture rentals. Many of these Houston companies will staff personnel for specific calling campaigns, technical support contracts, or customer service contracts. Office furniture rental is the ideal way for these Houston companies to accommodate a fluctuating staff whose numbers fluctuate significantly based upon the amount of contracts they have in place at any particular time. Office furniture rental is also a good choice for many Houston companies who are in the process of expanding. It is not uncommon for an organization to open a new branch office in a very small facility and then move into a larger one once the new branch begins to turn a profit. These organizations can a great deal of money renting office furniture for their smaller facility until they are ready to move into a larger office. Cubiture strives to accommodate Houston businesses with office furniture rentals that fit their budgets as well as their workspace. We focus on renting chairs, cubicles, and desks because these items are the most practical and necessary in even a basic office environment. There are additional, larger office furniture items we can rent, including mobile filing systems, storage systems, lounge seating and furnishings, and training room setups. One thing that sets Cubiture apart as an office furniture rental source is our month-to-month rental policy. Unlike most companies, we do not require our clients to lease for a minimum of 3 months or a 1-year maximum. Contact Cubiture now at 713-412-0900 and find out if office furniture rental is the right choice for your business.